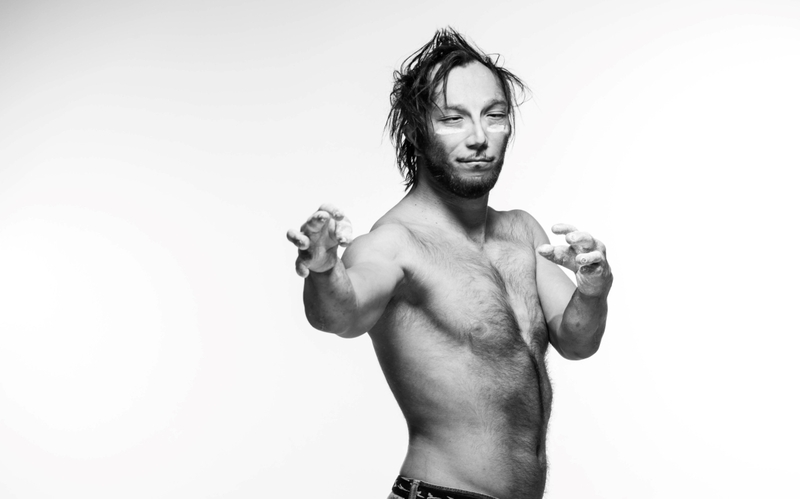 My name is Philippe RIBIERE. I was born in Martinique on 12th March 1977 with the Rubinstein-Taby Syndrome and was abandoned in an orphanage. For 4 years, I had multiple surgery operations in order to ensure my functional mobility of my hands and my feet. I was already adopted in France and had 4 sisters and 2 brothers in my new family and continued to get surgeries until I was 12. For my education, my foster parents decided to take me to a normal school. I have never been in any special centers for handicap persons. Naturally I participated in the same activities with my brothers and sisters. I started biking when I was 7, I went swimming, I played football, I did almost all activities I wanted to try. Although as normal as I could be, I got some bad feedback from adults laughing and looking at me like an Alien. My innocence was gone…Never mind, it hurts. At the age of 12, I run with my brother in some official cross-country races and I enjoyed it because it was the first time that people supported me to finish the race and give all I got, as a normal runner. It was fun and also a sign for me to recognize my handicap like a bonus. I do as everybody and probably sometimes better compared to others. An expression says : “ the integration by the sport”. At 16 years old, I went to a summer camp not far my hometown. We practiced many sports like kayaking, trekking, biking and climbing. In my first initiation on climbing we had to do the rappel. I got scared at the idea not to hold as well the rope for the descant. I did it and I was so happy to know I can also use my hands for some extreme activities. Weeks later, in my home town, I wanted to do a sport after finishing my studies just to relax and be outside. I’m happy that I went at a bike club and the guy in charge checked me up and said directly to me “you are not welcome in my club”. Next I visited a guy who managed a climbing club. I asked if I could join. Without giving me any problems or fears he said “you are welcome”. At 18 years and 2 years later I competed in the Young National Championship with my friends climbers who motivated me to climb and to be proud to climb at this level of this competition in compare to others who couldn’t. I finished last but it was the first time anyone saw a climber with some handicaps. At this period climbing had the secret wish to become an Olympic game and naturally I decided to push the international federation to create this new category for disabled climbers. To do that in 2003 I created my Handi-Grimpe association to establish an event, where everyone could join with or without a handicap. The concept is to put an artificial handicap (blind, imputed members or other) at normal people so they can understand a little bit what it means to be handicap. 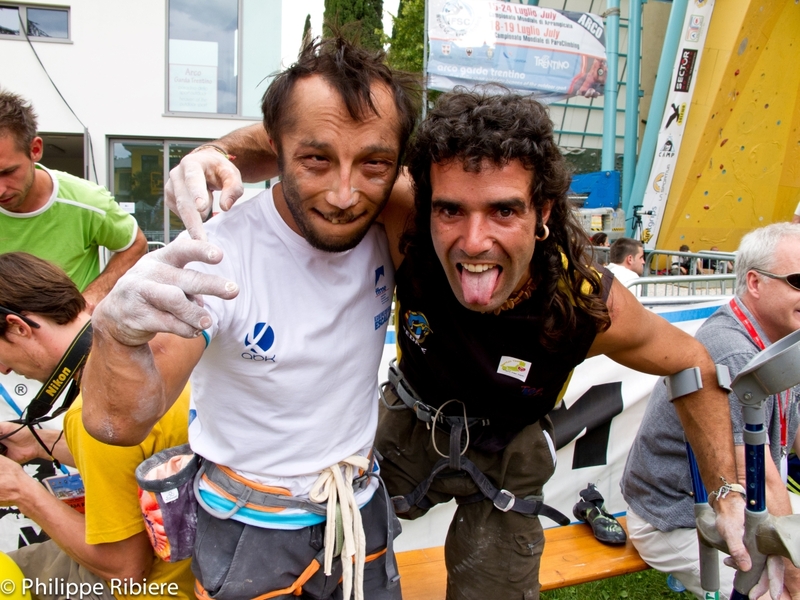 After 8 years, Handi-Grimpe is the only event that has the recognition of the French media, brands and climbers. 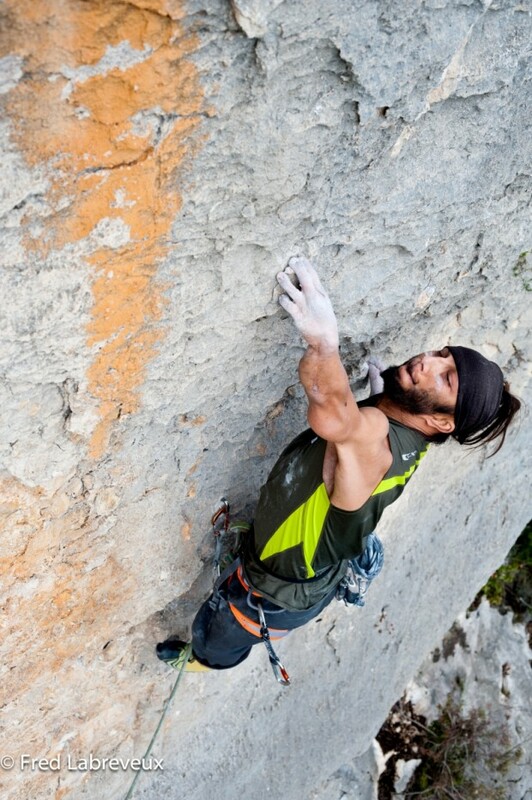 I am now an ideal representative for the Petzl, North Face, Beal, La Sportiva et Julbo communications teams. The confidence and support they have granted me are the foundations for my future achievements: such as the European Tour (www.evolution-tour.com) and many more. Waow! This interview starts really with a philosophic question and I like it. What could be? If you see well my body is different than you and it gave me a lot of suffers when I was a little boy until I became an adult person. My wish is really simple that people love each other, people do not make any judgment on appearances, intelligences, color race, religion and etc. Can you believe it one day? My position in the climbing community is to help disabled climbers to enjoy the extreme sport even their disabilities. When I started the climbing, the handicap category did not exist at all and I pushed myself to promote it by some demonstrations during the regular competitions that in the future, the paraclimbing could exist. My main focus is to help other handicapped climbers who have not the same energy than me to show us that they are also athletes and humans. In egocentric way, I am proud to have influenced the climbing community and the international federations to create the Para-Climbing category for the disabled climbers. I am proud of it and I can’t hide it. Also I am proud to be recognized by medias and sponsors in our sport but the best is to be for people who meet me during slideshows or else that I am an example for all people (disabled or not). It is hard and really simple to understand our sport. We are climbing on the vertical structure like the rock or the plastic wall. We only have four members to ascent the support. We have to play also with the weightlessness and it is a really big part of the game. We have to understand the easiest way to reach the top with our own body and our different perception of understanding the way of the top. It is not necessary to be the strongest man in the world to be the best climber. We can prove this by the best climber of our decade who is a skinny guy. In bouldering also, one of the best boulderers is skinny. So doesn’t matter if you are tall or small. The most important is to be a smart person and a patient person. Also we have to respect rules of safety in the alpinism, in the ice climbing, in the rope climbing and in the bouldering practice. If we don’t respect all of these rules, the accident is not so far to remind you that you are a small grain in the world. We have only one life! It could be better to enjoy our hobbies in a safe way. I am talking like this but paradoxically I practice one of the dangerous practices: bouldering. 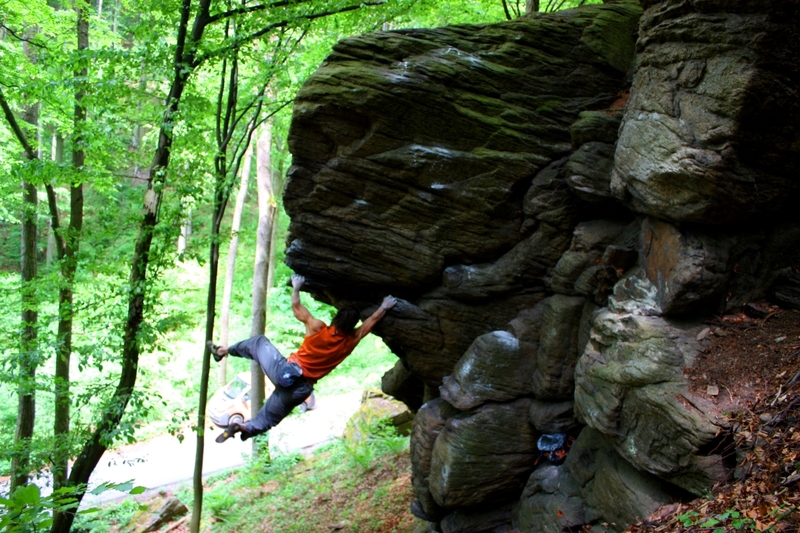 Bouldering is a practice without any help like a rope. We can climb some boulder problems until 7-8 meters. Hopefully I have my friend who can spot me. With some crash-pads (like a small mattress) we have a soft reception (depends on the high) in case we fall on the top or some risky movements. It is a complicate question. It is fast sensation about the performing. Before competing in the para-climbing I did not have any idea about the pure performance. Why to compete? In the past I knew I could reach a certain level but I did not have a person like a coach (still not have) to train me, to trust me, to talk about projects, etc. It is important in the career of an athlete and I just get the information about competitions, in general. My position of a “handicap person” has not been in the competition for the studies, for the job, for appearances, etc because it is impossible to compare what it is not comparable. It means I could not understand why we are so jealous or else about each other. Incredible or not, it is still my shield to do my job and to not look behind me if my concurrent is stronger than me because at this end there is always someone better than us. So! But in the competition, with my position as a star, I find out that my only one problem is my ego. The ego is good but it should not be higher than what you are truly. It can just help you sometimes to be aware about what you have to do: do your sport and performance! Basically I just go with the pleasure to climb. 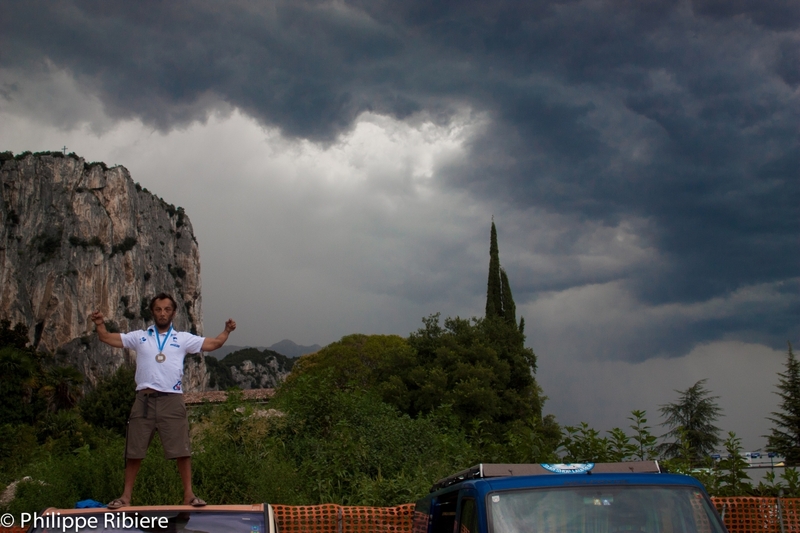 I won’t be like a total professional climber just to not forget that it is first my passion and my reason to live. But if we are talking about competitions, when it is necessary, I train five days in the week with four hours per day of training. So it is hard, exhaustive, painful but day after day I see all my progressions. For example with my handicap it is complicate. Look! I have shorter arms, with no-flexible wrist, deformed hands with twisted fingers. A lot of things to manage in my sport but I never got it as an excuse to complain. At the end, I have not at all strength to climb. How am I doing? Before I explained that you don’t need the stronger man to climb the hardest line. 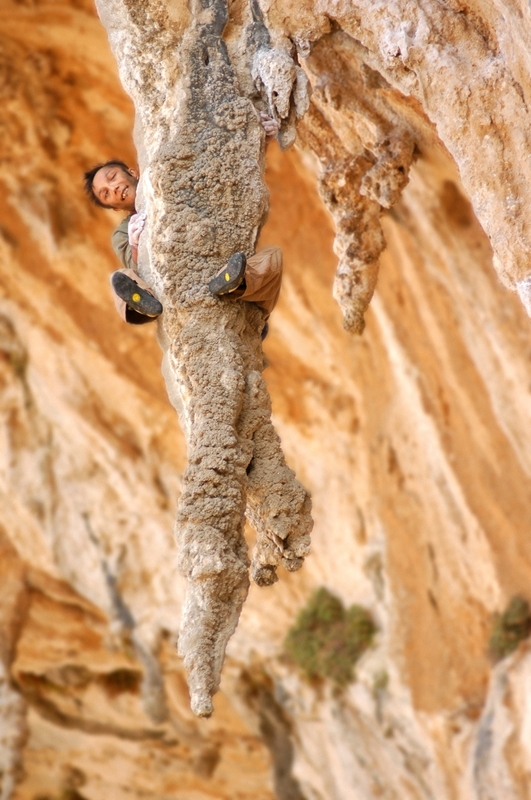 Climbing is more about the balance of your body in the connection with the rock. This is the main problem! Learn with your abilities. I am stressed to fall the first second meters. I am more afraid to not show my breeder that I progressed a lot and I want to get the podium. But myself, I can’t regulate rules about the sport and this is why I compete. I compete because it pushes me to be concentrated on my progression on the wall and to not show I am a good climber and a star. It is an interesting vision for me to know my metaphysical problems. When I will get the key I could maybe be once in my life a world champion. But to be honest with me, I know I did a lot of things in the sport that I can’t have any regret. I have not any fans! Sorry to disappoint you. I never wanted to be an example for anyone but after years I heard almost every day that I am one. Sometimes it makes me disturbed because I was an abandoned baby until 4 years old and I drove my life better than it was in the beginning. I missed a lot of love and I am not afraid to talk about it. 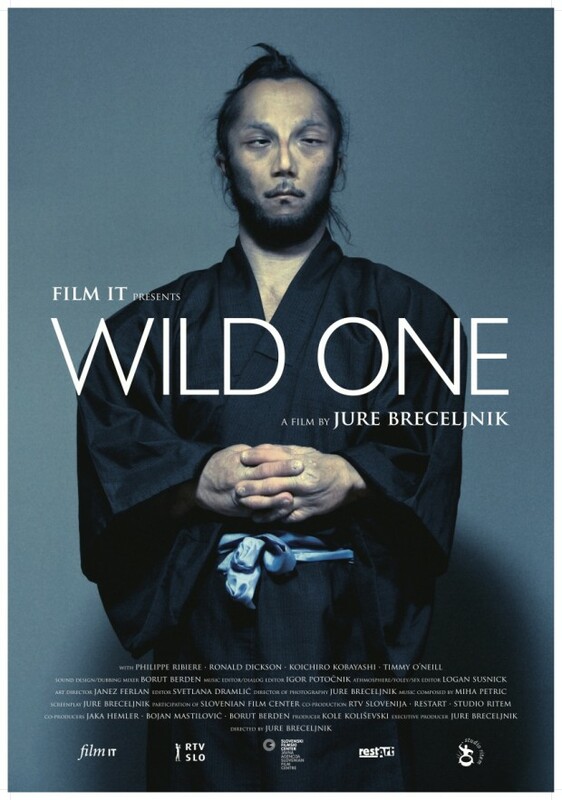 It is the subject of my WILD ONE documentary. How to miss the love and to get after years the respect and the love? It is not a miracle, it is a daily work. I can’t stand up and say at someone what he has to do even if he asks me for advices. I am nobody on this planet to give a secret, which could change his life. For all my life, since I got my conscience and the knowledge I thought the world will be nicer or at least Human and will be better for him. Because Miss Nature doesn’t wait for us if she needs to teach where our places are as a small sand grain in this universe. Then when she is in the rebellion she kicks us so hard that we cry without understanding and being aware about the reality. But we are so arrogant – I include myself- that the time we will truly realize all our mistakes it will be already too late. Do we wait for the end of our existence? Well! On these small explanations you can see that nobody is above anyone. So this is why I never give any advice until I should be perfect, even if the perfection exists. What are yours future plans? I like the sentence by a friend I met in Hueco Tanks. One day a climber girl asked him “What will we see in this spot? My friend just replies: “you will know when you will see it”. That means that sometimes I prefer to shut up my mouth before announcing my projects but I have a lot. Because sometimes my projects are falling down until done. Sometimes I am disappointed because I believed that some projects could be done. Like I said before I don’t give tips but…Be calm, trust yourself and enjoy the most beautiful sport ever made.